This is a great entry. I think people need to start talking about total energy. Tesla's apparently are always consuming power and owners must always keep it plugged in when not driving. There are plenty of stories floating around the interwebs about Teslas consuming their batteries to depletion. For some reason, Tesla allows their batteries to drain to 0, which everyone from laptop owners to engineers know is a no-no for lithium ion. Having overseen development of rechargeable batteries before, omitting what is called under-voltage protection that disconnects the batteries from the load when they reach a minimum voltage, is ludicrous. 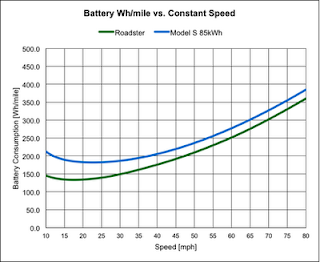 The circuitry is small and cheap, and almost every battery manufacturer recommends it at the specification phase. Once the battery has discharged to 0, you now own a very large and expensive paperweight.